I decided to give Julep Maven a shot with one of their deals. Julep Maven is a monthly subscription service that sends their subscribers nail polish and beauty items! 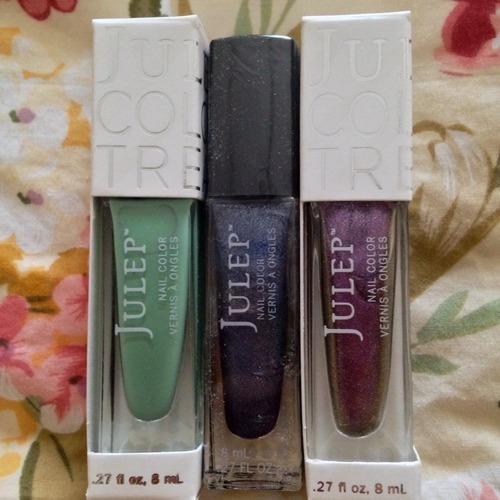 Julep is slightly on the pricier side compared to other subscription boxes I’ve subscribed to, $24.99/month, but I think it’s worth it if you’re a nail polish + beauty addict! Luckily Julep has coupon codes for first time subscribers so I only had to pay shipping – $2.99 -for my first box! I’ll share the codes with you at the bottom of this post! I love the colors of all the nail polishes I received! I believe each polish is valued at $14, so I think this box was an amazing deal considering I only paid $2.99 shipping! Here are some codes you can use to get your first box for free! Become a Maven now! You can use code FREEBOX to get your first box for free! Just pay shipping! OR FOR A BETTER DEAL, if you are a Swagbucks user you might have seen the Julep ad! You can get 800 Swagbucks for using the coupon code, SWAGBUCKSFREE, and you would get the same deal! You can use the 800 Swagbucks for a $5 Amazon card (only 450 SB) or any other type of gift card! Be sure to read this post to see other limited edition welcome boxes with more items and a better value for the same price, $2.99 shipping! Remember, this is a monthly subscription service so if you just want to try out a first box I advise you to use a prepaid gift card in case you forget to cancel your subscription.